The House of a Thousand Memories Talks To Me…………Random Thoughts of a Childhood Long Gone. A house talks…………Memories of a childhood long gone. I have just returned to Toronto from a short trip to Sri Lanka. I have been going back to the old country every year to visit my ailing mom but this trip was different. Let me explain. 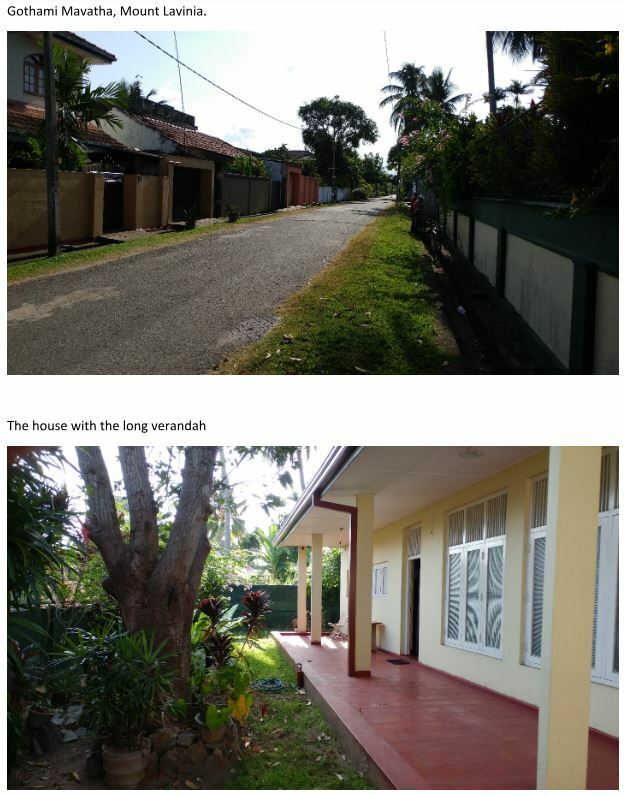 I grew up in Mount Lavinia, in a pretty normal middle class neighborhood. People who lived there were mostly professionals who served the Government of Sri Lanka in the 1960s and 70s. They were civil service officers, educators, postal service professionals, doctors, engineers and retired army officers. It was a multi-religious, multi-ethnic neighborhood, Singhalese living next door to Tamils, Burgers and Muslims. Buddhists sharing the area with Christians, Hindus and people of Islamic faith. Not a lot of mixing of these groups but aware of each other’s cultural activities and traditions. Everyone respecting other’s right to a normal life with friendships that cross racial and religious boundaries. This was before the 30 years of collective madness that tore the societies apart. I lived the story that Shyam Selvadurai wrote about in his book Funny Boy. We the kids all went to the same collection schools in Colombo, boys crazy about school cricket and girls crazy about Elvis Presley and later, of course the Beatles. My father built the house that we grew up in the mid-1960s. This house that my sister and I called home, is soon to be demolished to make way for a new house that my sibling and her family is planning to build. That is why this visit was different. This was my chance to visit and see this beloved house for one last time. As all our visit to Sri Lanka are these days, it was a rushed two weeks. There is never enough time. There are many things you have to do when you visit the old country. Spend time with mother, fulfill family obligations, visit ailing relatives, participate in a wedding or two, normal things that extended families do. Then of course, this being Sri Lanka, take some time off to visit the hill country and the beaches. Amid all of this I really did not have that much time to visit the old house down Gothami Mavatha, off Templars Rd in Mount Lavinia. On the very last day that we were there I had a chance to go to the house. It was a quick visit while rushing to get all the final things done before we left for the airport for the evening flight to Toronto. I dashed in, took a few photos of the road and the house, and went on my way without too much thought. Later as we were waiting for our flight at the Colombo airport’s departure lounge I began to go through all the photos that I had taken during the visit. I am a photographer and I take lots of photos when we travel. As I came to the set of photos that I took at our old house that morning the time seems to stand still. These photos take me back nearly 50 years to a different place and a different time. As they say, it was long long time ago in galaxy far far away. The road has changed a lot. Back in the day it was a gravel road with low parapet walls separating the small gardens from the road. Those days it was always was full of kids, especially during school vacations. We played road cricket on that road all the time. Many of my friends lived down that road and every house was open to every one of us. We would start the day at one place then spend the day at many houses depending on what we were up to, going home only if we got hungry or when the evening approached. Our parents were not worried about where we were or about our safety. They definitely were not helicopter parents. We learned all about life on that road. We learned how to deal with stuff and how to get on with others. Of conflict resolution and peace making. We learned about being leaders and team players. We learned to share. If one kid had a ball and another had a bat that was an instant cricket game with another kid supplying a wooden board for the wicket. But now? The road is all paved. No more pot holes that become small ponds during the monsoon. Good for driving, but can you play road cricket on that? The houses that we all ran in and out of now have tall walls that hide them completely from the road. Progress and security concerns have arrived on Gothami Mavatha. The canal that we sometimes waded in catching guppies is now all enclosed. Where are the kids? It is school holidays but the road is deserted. Most probably they are all in their respective houses playing xbox or watching videos on Youtube and facetiming on their smart phones. Don’t they play road cricket anymore? No wonder the national cricket team is in such a bad shape! What about the house? That house that I grew up in. That house with a thousand memories. The house that was a home to me and my sister and to a host of my cousins. It now stands deserted, almost empty. At the moment it is being used as an office but will soon be demolished as it is not practical to maintain it anymore. A new house with all modern conveniences will rise there. I look at the long verandah at the front. No one is there now. It is empty. I remember it being full of kids most of the time. It was considered a neighborhood meeting place. I did most of my reading there. We used to hang out on that verandah discussing everything under the sun. One day a friend and I would be playing chess while listening to a cricket commentary on the radio. Another day four of us would be playing carrom, that ubiquitous game that is played throughout Sri Lanka and India. Another time, us boys, now in our teen years would be helping my father to dismantle and repair our car. By the way, we used to have a blue Ford Anglia, identical to the flying car of Harry Potter movies! Now that verandah sits empty, forlorn, sad and lonely. Tears come to my eyes. The fruit trees that adorned the garden are all gone except for the old mango tree that may father planted many, many years ago. 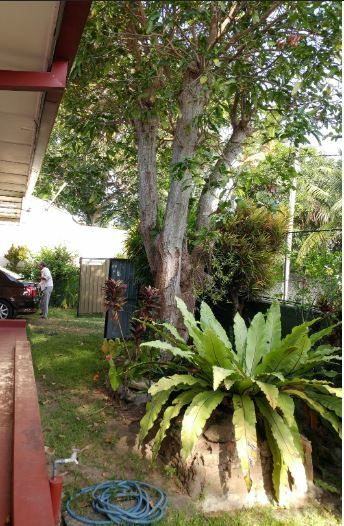 One time we had mango, banana, guvava, king coconut, jambu (rose apple) and few other types of fruit trees. 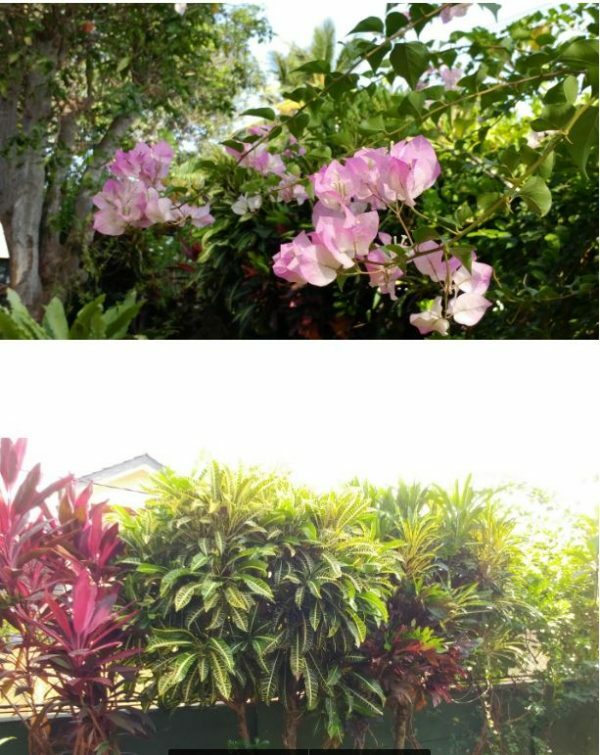 There was time when that guava tree bore so many fruits that we supplied the whole neighborhood with buckets of guava. It was a small orchard that my father single handedly grew. All gone now. As Buddhists we should not mourn any of this. Everything is impermanent we were taught. You are supposed to let go. But it still hurt. As I look at the photos, the house is talking to me. It is an old and tired man. He is pleased that I have come to visit him one last time. He seems to read my mind and is asking me questions. Do you remember the first time you moved in to your room when I was new? Do you remember that road cricket game when you scored 91, your highest score ever? Do you remember trying to paint the windows with a friend and making a royal mess of it? Do you remember the joy of getting the A-Level results and realize that you have scored enough marks to study engineering? Do you remember the violin lessons and your music teacher that came to the house while you secretly wished that you could be playing outside with your friends? Do you remember self-learning to play the guitar and realizing that you could make decent music? Do you remember the heated political discussions that you had as a university student with your cousins? Do you remember you and the boys dancing to tunes from Bollywood, Sangam, Aradhana, and Hathi Meri Saathi and a host of others? Do you remember the loneliness you felt when your sister went out of country to study? Do you remember the sadness of leaving home and the country for the first time? Did you know at that time that you would never ever come back permanently? Do you remember the first time you brought your son, then seven months old, to the house to find your own crib is set up in your old room for him? How much do you remember and how much have you forgotten? If only those walls could talk, I think. Of course I am talking to you, the old house says to me. But soon you will be no more, says I. Don’t be sad, says the old house. Walls may crumble, roofs may cave in, trees may fall, but memories will remain….god, what memories they are. « Lankan Envoy to Austria Priyanee Wijesekera and Five Embassy Staff on Extension Recalled to Colombo Immediately After President Sirisena’s Long – Distance Calls to Vienna Were Not Answered.